Per Edvard Olsson (Edward or Ed Olson in America) was born on March 27, 1898 in the farming village of Krovåg in the west-central province of Jämtland, Sweden. He was the eighth of ten children born to his father Olof and the fifth of seven children born to Olof and his second wife Maria Melin. Olof's first wife, Karin nee Edlund, died following the birth of Edward's half brother Anders Olof (Andrew). Although separated by thirteen years, Edward and Andrew became very close. In America, Edward was Andrew's mining protégée, then partner, and finally successor, in the mining business. Ed's first-grade schooling was interrupted when his father, Olof, then at the age of fifty-six, decided to immigrate. Olof believed that his children would have a better future in America. Three of Olof's brothers and his oldest children, Ellen and Andrew, had already immigrated to the United States. Times were hard for farmers in Sweden. Over the centuries, farms had been divided again and again for the children's inheritance. The resultant small farms could not support large families. The Olsons were among more than a million Swedes, or twenty percent of Sweden's population, who left their homeland in the late 19th and early 20th centuries in search of opportunity and adventure. Residents of Kröveng were especially susceptible to America Fever. One-hundred eighty-six people, more than half of the village's population, immigrated and most of them moved to northern Washington and adjacent British Columbia. Olof and his remaining family left Sweden on May 29, 1905, accompanied by Johanna and Erik Westlin, Ed's aunt and uncle, and their children. The trip, across the Baltic and North Seas, the Atlantic Ocean, and the North American continent must have been a major adventure for seven-year-old Edward. The extended Olson family traveled by train to Gothenburg, where they boarded a ship for an intermediate stop in England. The small party sailed out of Liverpool for America on the S.S. Saxonia. The ship's larder had a plentiful cargo of onions, which the Olson children were told to eat like fruit. They ate heartily what was set before them but developed a lifelong aversion to onions. The Saxonia landed in Boston, where the Olsons boarded a train for their new home. Olof's family arrived in Stanwood, Washington, on June 26, 1905. They stayed with Andrew and Ellen at Olof's brother John's home in Stanwood for six weeks. Then Olof and Edward's uncle Erik bought land in Matsqui, British Columbia, and moved their families there. Ed continued his elementary education in Matsqui, attending school there for six years. In 1912, the Olsons left British Columbia and moved next to Ed's uncle in Avon, Washington. Olof, who had prospered in Canada, bought fertile land, built a large home, and farmed barley, rye, and flax and raised sheep and dairy cattle. As was expected, Ed and his siblings helped out on the farm. Ed continued his formal education for one more year and later took several correspondence courses in mathematics and electricity. 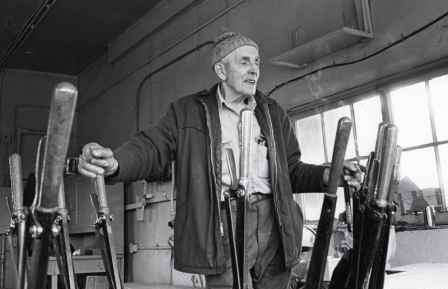 As a young man, Ed built the dynamo that supplied electric light to the family farm. Ed was technically gifted but also was an entertainer and a musician. In 1920 he traveled around the United States in a Model-T Ford truck performing an electrical act at theaters with Karlo and Company. On one of his jaunts, he met Hilda Klingenberg, an attractive Norwegian immigrant, at a Grange near the Olson farm in Avon, Washington. She played the piano and sang, and he played the slide trombone and also sang. They both were agile on the dance floor and loved to kick up their heels to a lively polka tune. Ed and Hilda were married on July 5, 1921. In 1927, the young couple moved to North Bend, where Ed built logging roads for the North Bend Timber Company owned by Robert W. Vinnedge and William C. Weeks. Depression struck Washington State in 1929 and Ed was out of work. In the meantime, Andrew was developing a prosperous mining business in Alaska that could use additional hands. Andrew and two friends, Axel Palmgren and Tony Lindstrom, had formed Olson and Company and had bought the Happy Creek placer claims in Flat. Earlier operators had failed at Happy Creek. Andrew's dragline operation with an elevated sluice proved a success. Ed and his youngest brother Fred (born Bror Sigfred) joined Andrew's gold mining venture at Flat in 1931. At Olson and Company, Ed was responsible for running the dragline excavator, while Fred tended to all the equipment in need of repair. Ed and Fred were assets to the company, and they received ever greater responsibilities over the gold mining operation. In early 1932, Olson and Company needed additional funds to expand the operation at Flat. Ed and Andrew approached Ed's former employers at North Bend, Robert Vinnedge and William C. Weeks, who entered the Olson and Company partnership and put up the money to expand the mining operation. The new company, called the Northland Development Company (Northland), consisted of Ed, Andrew, Palmgren, Lindstrom and the two Washington timber operators. Northland expanded operations at Flat and began to look for new ground. By chance, Andrew met Walter Culver, a prospector-promoter, on the train from Seward to Anchorage in the spring of 1933. Culver told him that platinum had been discovered near Goodnews Bay, Alaska, by an Eskimo named Walter Smith. Culver encouraged Andrew to invest in the new camp. Under Andrew's direction, Culver bought out the lease claims held by eight-to-ten platinum miners, who were eking out a living by the rocker box method. Andrew, Ed, and their partners planned to use the same type of dragline operation that had proven successful at their Happy Creek operation. With a federal loan of $250,000, the Northland Development Company purchased the equipment to run a full-scale commercial platinum mining camp at Squirrel Creek, a tributary of the Salmon River. Ed stayed in Flat to run the gold mining operation. When Wylie Post, the famous aviator, crashed the Winnie Mae near Flat on July 20, 1933, Ed was there to assist. He devised the plan of building a tripod from spruce poles to right the plane. With help from Joe Crosson and his crew who flew parts from Fairbanks, Post was able to complete his flight and become the first person to solo around the world. In late 1934, the Northland partners formed a new corporation, the Goodnews Bay Mining Company (GBMC), which was incorporated in 1935. The next year, Andrew, who was president of the company, asked Ed to assume a management role in the platinum operations. The partners expanded exploration and acquired new equipment. Substantial new deposits with commercially viable platinum values were discovered under the Salmon River, but they were so deep that they couldn't use any of the machines on site to extract the ore. They could, however, be mined with a large floating bucket line dredge. GBMC received a U.S. Government Reconstruction Finance Corporation loan of $600,000 to purchase a 1,400-ton Yuba dredge with 94 one-ton buckets. The large dredge arrived in pieces that had to be transported for miles to the Salmon River site where the huge machine was erected - a major task. Alaska's new platinum industry and the GBMC had attracted worldwide attention. Word of the GBMC findings and the plan for the dredge spread across the U.S. and Canada, setting off a stampede by air in late 1936 and early 1937. J.C. Roehm, Associate Engineer for the Territorial Department of Mines, and J. B. Mertie, Jr. with a field party of the U.S. Geological Survey came to study the deposits and prepare topographical and geological maps. The platinum rush also caught the attention of Ernie Pyle, the famous correspondent for The Washington Daily News, who wrote a series of eight articles about the platinum stampede in August, 1937. In order for the company to grow and keep pace with the demand, Andrew asked Ed to be vice president and general manager of the platinum operation in 1937. He saw that his talented brother had managerial as well as technical skills. Although they were both in management, they participated in the physical labor as well. When necessary, they donned their hip boots and worked alongside the crew. It was no wonder they were well liked by their employees. The camp was remote so it had to be self-sufficient for the mining season that lasted approximately 185 days. It quickly gained the reputation for being a good place to work with its comfortable living quarters, recreational facility, excellent food prepared by Ed and Andrew's sister Anna Brown, its family-friendly atmosphere, and strong ethics. What Ed and Andrew lacked in formal education, they made up for with their intelligence, problem-solving abilities, and inventiveness. They strove to improve the mining process in order to make work easier for their employees and to make extracting and processing gold and platinum more efficient. At Flat, Ed developed and obtained a patent for a recovery improvement to the Yuba dredge later used throughout the world. He also invented many labor-saving devices for the platinum mine: an ice saw to remove ice around the dredge; the Olson Screen Section; a Revolving Screen for jigs; a vibrating hopper to clean sand and gravel from the heavier platinum and gold; a Coffer Dam; an 8-Ton Ripper; and a Lazy Swede, an automated hydraulic giant using water flow to move the nozzle. In the fall of 1942, the U.S. War Production Board banned all mining operations not essential to the World War II effort. Gold, which was used mainly for jewelry and money, was not considered an industrial metal, so the Olsons had to close the gold mine at Flat. Platinum, however, was a strategic metal and the GBMC platinum mine received an exemption since it was the only source of domestic platinum, a mineral used as a catalyst in gasoline production. Furthermore, iridium, one of the platinum group metals, was used to make the contact points for airplane spark plugs. Recognizing the importance of the platinum mine, the U.S. Army dispatched six soldiers to guard the dredge from Japanese attack. As the war progressed and fear of the Japanese lessened, Ed gave the soldiers jobs at the mine while they were not on guard and let them use the recreation center. The soldiers formed a bowling league called the G.I. Angels. Their toughest competition was from Ed and his league of miners. The soldiers were happy to be working and to have diversions to keep them occupied. In the summer of 1950, Ed returned to his homeland with Hilda and their children: Eugene "Sonny", who was adopted in 1941, and Karen "Kajsa", who was adopted in 1943. They also visited Hilda's native Norway. Twenty years later, Ed and Andrew were part of a delegation that traveled to the Soviet Union to investigate potential oil lands. They visited the cities of Irkutsk, Moscow, Tashkent, and Samarkand, as well as Lake Baikal. When Andrew retired in 1970, Ed became president of GBMC, though he had actually handled the company's daily operations for many years while Andrew concentrated on exploration. Ed continued to manage GBMC until mid-season 1976, when the platinum mine ceased operation. "It has been the most interesting life you can imagine. There were problems, sure, but that is what made it fun. If I were younger, I'd still be up there digging. But now it's time to quit." "Ed always credited the crew for the highly successful operation at Platinum. It was Ed, with his highly inquisitive and inventive mind, that solved numerous problems that developed and designed many improvements in the various facets of the mining plan and equipment." In 1983, the Seattle Pacific Science Center hosted an exhibition about Ed and his contributions to the mining industry. Ed died on December 23, 1988, in Seattle, Washington. Hilda died 20 years earlier in 1968. In his latter years, Inga Ahman kept house and cared for him in his home on Seattle's Magnolia Hill. Ed is remembered as a devoted father and grandfather, who loved all children. He enjoyed serving ice cream cones to the children of miners and Yupik Eskimos at camp. In the 1960s, he drove a school bus there. People who worked at the mine and relatives say that he was a wonderful, thoughtful, and kind person and a caring employer. He and Hilda frequently entertained employees and former employees at their home in Seattle. One former miner said that Ed and Andrew were among the greatest miners of their time in Alaska. Johnston, Julia Olson Rowe, "The Olsson Brothers of Krokvåg, Sweden: Their Ancestors and their Descendants". Lindstrom, Jan Olof G., and Olson, Karen, 2004, "The Platinum King - Andrew Olson's Story", Book Publisher's Network, Bothell, WA. Patty, Stanton H., "The bad news: No more platinum from the Goodnews", "The Seattle Times", May 6, 1979, page B8.